Welcome to the new gold rush, a rigorous U.S. and international corporate sprint for educational gold (in the form of your kid’s data) at all public schools. Authors David Spring and Elizabeth Hansen tour clever, stealthy, political, and corporate moves, mostly unreported in the mainstream press with their back story that greases the takeover of all public schools by as early as 2030 according to 2010 white papers from the Koret Task Force on K-12 Education at the Hoover Institute. The ones and zeroes of test score data make up new digital gold panned from 50 million kids aged Pre-K to 22. Got kids? Planning on kids? Grandkids? Do you teach in public schools? Concerned that school boards may become extinct? 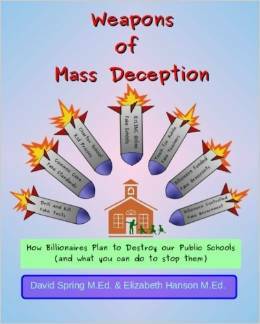 Expand your understanding of our public education crisis with Weapons of Mass Deception How Billionaires Plan to Destroy our Public Schools (and what you can do to stop them) by David Spring and Elizabeth Hanson with easy to understand graphics and many links for clarification. Start a dialog with neighbors or interact with the authors, they’ve included their email address. Available for sale at Amazon. Who Wrote the New CREDO Study? And What Do They Really Want? I guess they needed to produce a counter-narrative to cover their tracks? But who does the research for this new CREDO study? Perchance do they have ulterior motives for promoting a pro charter study? Let’s start with the funders. Walton is a familiar name to us all by now. CREDO receives funding from the Walton Family Foundation. Ravitch also covers the inside workings of CREDO in this report, as does Crazy Crawfish. And Who Does CREDO Employ? For more about The Center for Education Reform (CER) see my last post but to sum it up again here, CER is an active member of ALEC working diligently to serve their goal of privatizing public education. Why else stock a “sound research” program that is disguising itself as providing unbiased grounded data with people who have a clear motive to make the charter enterprise out to be things that it is not: effective, sustainable, democratic, ethical, equitable, caring …or public. CREDO’s studies are the equivalent of Phillip Morris’ studies that smoking does not cause cancer. Like the Tobacco Industry, the Charter Industry has to find any means by which to protect it’s own interests. Is Baltimore Rolling Out the Red Carpet for an ALEC Front Group? those were all just a forecast. 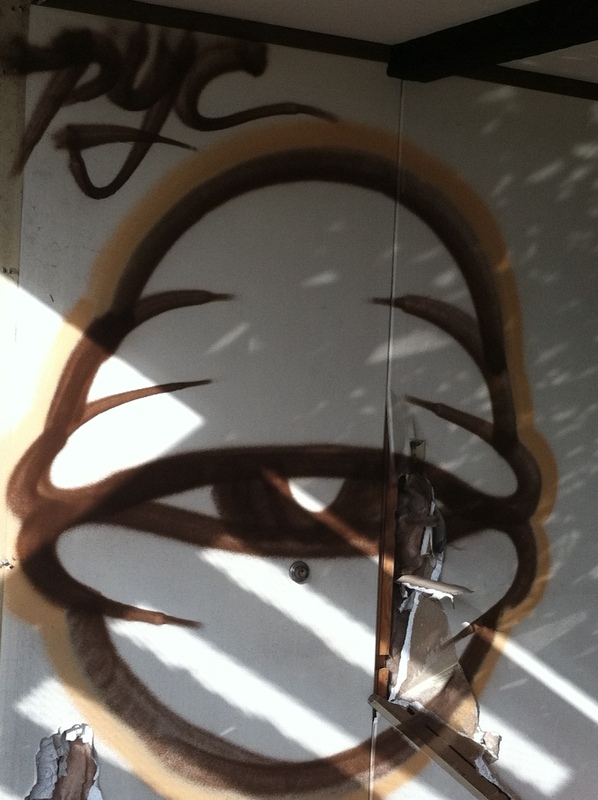 CER is powerful. They have money. And they know how to spin a message. Make sure that every teacher, parent and administrator you know has the facts. And ignore CER“spin” as demonstrated in their letter. IT IS NOT GROUNDED IN FACT. IT IS NOT GROUNDED IN RESEARCH. Hell, IT’S NOT EVEN GROUNDED IN REALITY. But if we won’t make noise and push back, we will herald the destruction of our local unions, our teachers, and our public schools. What’s their motive? They are active members of the American Legislative Exchange Council (ALEC) whose goal is to completely eliminate public education and teachers unions. Jeanne Allen, who founded CER, claimed credit for writing the ALEC proposal for the parent trigger. CER works closely with any other organization that opposes public education and supports privatization. Allen refers to the traditional public school system as “The Blob.” Jeanne Allen, has an agenda, and that agenda is choice not achievement. And like Macke Raymond from CREDO, Allen sees the reform agenda as a war. According to PR Watch: Charter Schools USA and Apex Learning, are corporations that are part of trade groups that are members/funders of ALEC, such as iNACOL, the National Association of Charter School Authorizers (a former ALEC member), and the Center for Education Reform (a current ALEC member and the employer of ALEC’s former press secretary Raegen Weber), which have participated in ALEC’s Education Task Force where legislators and private sector members vote on bills to benefit these industries. They work on four fronts: School choice, charter schools, online learning, and teacher quality. The only form of parental “input” recognized by CER is whether parents can choose their kids’ schools … If your idea of “parental input” is limited to one single act of choice, not unlike going to Walmart to buy a new microwave, then I feel sorry for your children. “Teacher quality” isn’t a measurement of, oh, the actual quality of a state’s teachers. It amounts to this: Are there state-mandated annual teacher evaluations? Are tenure and retention tied to those evaluations? In other words, have the teachers’ unions been whipped into subservience? As for “online learning,” CER advocates the availability of “a full-time online caseload.” Which is great, if you want your kid’s education supplied by the University of Phoenix or some other for-profit scam artist. In short, this CER report is pure ALEC-style horse hockey. “The Task Force had a very successful meeting as the guest speakers addressed a standing-room-only crowd. Jeanne Allen from the Center for Education Reform spoke on the need for charter school options and how state legislators must pass laws to give these schools the autonomy they need to be successful. Ron Packard, CEO and Founder of K12, shared the overwhelming positive results of his virtual charter school program. Forced privatization is not choice. Many, many schools are forced to close or co-locate with a charter, against the desires and struggles of the communities they serve. Children as young as six in charter-lands like New Orleans are forced to often take 2 hour bus rides each way across town to attend the charter school that would take them. The choice rests with the charter schools who can expel or “counsel out” students they don’t want to educate or cherry pick the students they will serve. KIPP for example has enormous attrition rates. But all they show the public are their test scores. Poor test takers are “removed” and left to fall between the cracks. Charter schools have increased segregation in cities all over the country. A study in 2009 from CREDO at Stanford University found that 17 percent of charter schools outperformed their counterparts, 37 percent underperformed and 46 percent were not significantly different. There are too many charter school scandals to note. But with less accountability, and profit motive to private companies receiving our tax dollars, it is clear that quality education to our children is not their main goal. This new legislation will destroy teachers unions. It’s all clear in the ALEC model legislation. 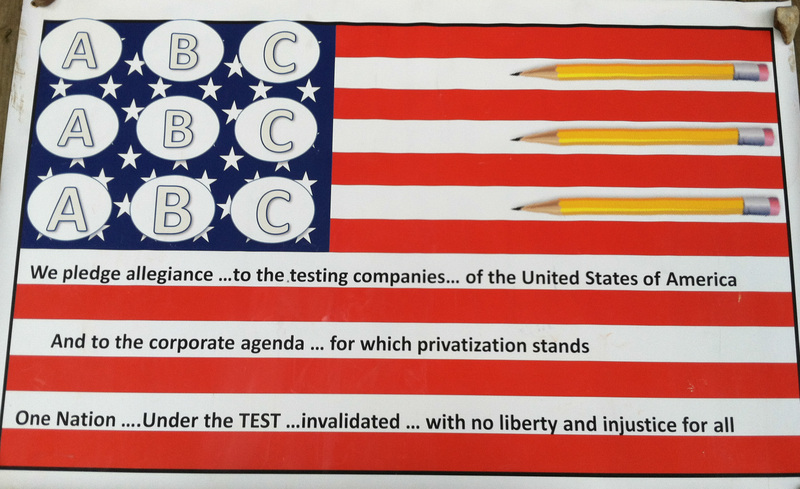 No, this is not a contentious and offensive analogy between Common Core, testing and Nazi Germany. It’s a post about how a movement can be co-opted. And how to fight back. It’s about strategy co-optation and “ideological camouflage” in which one agenda can be disguised as something else. In this instance it’s about corporate players camouflaging private interests as a public good, and then pointing the blame elsewhere as a distraction. These strategies (listed here) are not top secret. Anyone who has taken marketing or advertising 101 knows how public perception can be manipulated by media and “research.” Because something is not common knolwedge does not make it conspiracy. It just makes the public susceptible to ideological manipulation. I reference here a few historical and fictional examples of how such strategies have been used, and how the American Legislative Exchange Commission’s (ALEC’s) agenda to corporatize, profit from and privatize our public schools eerily mirror these tactics. So what if…just what if… you were an organization that intended to privatize public education? Given how deep seated our democracy is with the ideal of public education, such a proposal would not win over very many except the most die-hard followers of Milton Freidman. Perhaps you’d get more people to adopt your agenda if first you created systematic “reforms” intended to be a flop. And then when the reforms “fail” you could cash in on your real agenda? -obsessive amounts of data collection via the new tests, lobbying efforts led by Pearson, and political push by billionaires, and “research” done by big data gurus McKinsey and Co. So does ALEC have a blue print for this nutty proposal? You bet. In terms of our long term prospects, because we will be seen as a purely defensive movement, not interested in imposing our views on anyone, only interested in being left alone, we will surely gain the sympathy of the public … Sympathy from the American people will increase as our opponents try to persecute us, which means our strength will increase at an accelerating rate due to more defections–and the enemy will collapse as a result. So, how can you tell if co- optation is happening? There are three tenets to examine: message, funding, and motive. Messaging is the equivalent of marketing or advertising. It’s what you see on the shiny brochures or classy websites. It’s the sound bites. They may often promote similar goals and values. Or at least claim to. This is where they get folks on board. So it’s important to examine the funding and motive to see if your movement is being co-opted. Funding includes a deep examination of who is funding the organization. Though the messaging alone will not make evident your own goals are being cop opted, those who pull the purse strings pull the real agenda. The funding reveals the true motives. So what does it mean if an opt out group or an anti-Common Core group is funded by corporations? It means that the goals of those politicians, ideological agenda, or corporations funding the group are the true motives. It means co-opting is taking place. Message: Support Opt Out. Funded by: Corporations X,Y and Z. Motive? 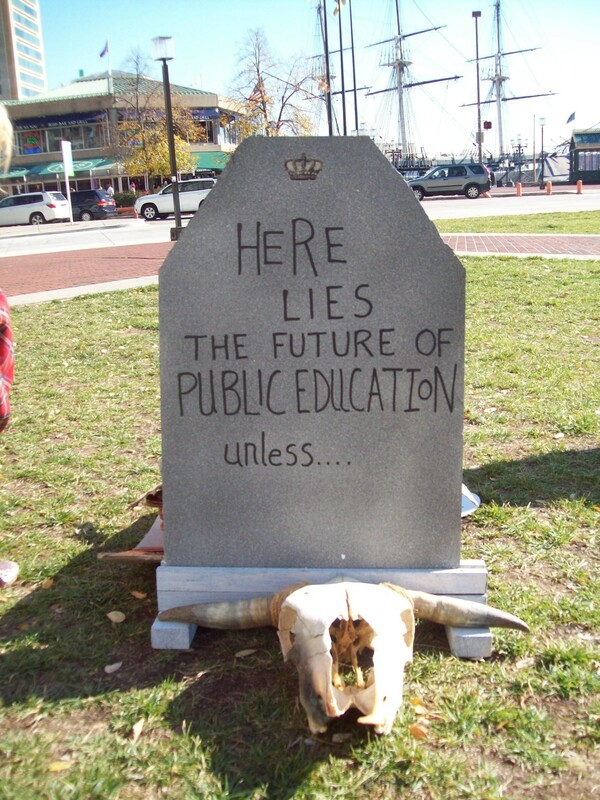 Take tips from Paul Weyrich — Opt out because “public schools are rotten. Promote privately run charter schools.” This is not the message of United Opt Out nor part of our motive! Co-optation is a way to use the energies of genuine activists and redirect them without even realizing its happening. So via charter schools and 21st century curricula (aka Common Core), reformers create in the “illusion” of “public” schools, of supporting opportunity, of caring for kids: but beneath the surface something else entirely is being built; it is an ideological bait and switch toward privatization. And their strategy (from the playbook of Weyrich) is to build a narrative that will make public education “forgettable.” With the new faux “reforms” and enough time passing, people will cease to long for what they’re missing. It worked in Warsaw. Why not for ALEC and education? ECS recently came out with an “opt out” document …to let folks know the legalities around opt out … This document allows folks to jump on the Opt Out Bandwagon, while defeating the main reason we have been successful as a social movement. We are successful because we recognize opt out as an act of civil disobedience. When folks share this document, while ignoring the social movement constituents – we are looking at a co-optation. Check out their funding: It’s a veritable Who’s Who of ALEC membership. ALEC and the tentacles of its myriad reform legislation has also learned much from the film Promised Land (2013) as well. leave something like this in your hands? After you let them bring it to a vote? rely on anyone. That’s how they win. They win by controlling every outcome. And they do that by playing both sides. Anyone who follows policy is aware that the American Legislative Exchange Council rides both side of the “reform” fence. In a nut shell, there are two “teams.” First there’s Team Heritage Foundation (also created by Paul Weyrich) and includes those members of ALEC who articulate an anti- Common Core and anti testing stance. Their claim is that federal overreach is an affront to “state’s rights” and local control. Not that we disagree with them on this. But Heritage Foundation has a very different motive and agenda than we do. Heritage and many other ALEC sponsored education front groups like Freedom Works are front and center in the efforts to lobby at state and federal levels for more privately- run publicly funded charter schools, including online education delivery systems (K12 Inc was the ALEC education sub-committee chair for years). Then there’s Team Jeb, (aka Jeb Bush) -those members of ALEC who support Common Core and its tentacles of reform including standardized testing, school closures and new teacher evaluations. If you examine closely the corporations who funded the development and implementation of Common Core and the new PARCC and SBAC testing regimes, you’ll find many of them are members of ALEC. See a full blown set of connections here. But…why? Why, if you are an organization dedicated to privatizing public education would you fund a “reform” policy for public schools which claims to “build 21st century career and college readiness” to rebuild public education? You wouldn’t. Unless… you knew it would be a flop. What if you knew you could help create a system so unbelievably bad, so offensive to parents, so harmful to teachers and schools (and quite profitable along the way), that you could generate a mentality which begins to hate public education itself? Then my friend, you’d have a hit. It’s “Springtime for ALEC”-the “flop” that enables them to win big. The cost? Public education. And our children. And The Threats Just Keep on Coming: Now Supporting a School to Prison Pipeline in Urban Schools? Keep your child home. Your child will not be promoted. You’re preventing your child from being successful. The school will lose funding. Out-of-school suspensions mean lost classroom time and, for some, disconnection from school. A recent landmark study of nearly a million Texas children showed that suspension increased the likelihood of repeating a grade that year and landing in the juvenile-justice system the next year. It also was linked to dropping out. (The administrator) initially stated that the children couldn’t come to school until testing was done. I told her that I know that’s not the case and they can’t be denied their opportunity to an education (although we know this testing madness is doing that anyway). She then went into how it’s a Code of Conduct violation and she would treat it as such. The language is on the second page of the memo attached. It would be a Level 1 or Level 2 violation if she chose to take it there. Refusing to take the test could amount to a Defiance of Authority, more specifically a “failure to follow directions” or a “failure to follow school staff questions or requests.” Both are violation of the student code of conduct and may be classified at Level I or Level II offenses. Although we know in Maryland from several letters from various counties, crafted at the behest of MSDE, articulate clearly that the decision to handle testing refusals ultimately rests with the local administration, many administrators would like us to believe that their hands are tied and that they are merely following the “policy” (which of course does not legally exist). Most curious though, we have seen many letters and administrative responses from around the state of MD, and have seen and heard a lot of county-level responses to testing refusals; some good, some bad, some ugly. But only in Baltimore City have we heard of schools threatening children with suspension. No suspension threats in Howard or Baltimore counties. Hmmmm. Given the horrific data that shows how children (often children of color) in urban schools are two or three times as likely to be punished with suspension as their county (White middle class peers) for the same exact “infractions”, this action on behalf of Baltimore City, should they enact this threat, perpetuates a racist and classist set of behaviors which could be addressed with a civil rights complaint. At least, a case could made against specific administrators since MSDE clearly indicates that such punitive measures are ultimately the decisions of the administrator to make! This is zero-tolerance behavior at its worst. In her (the school administrator’s)latest email to me she won’t admit that she is making this decision, only saying that she’s following the district’s guidelines (the memo clearly states that these actions are suggested in order to dissuade parents from “opting out”). Therefore I know that her hands aren’t tied as she’d like to have me believe. And that needs to get out there that they are working to strong arm parents into submission. Parents need to know that. We’d like to see more comparison data nationally from testing refusals as well. Are there patterns of different disciplinary threats or actions for city children and parents versus their suburban and rural testing refusal counter parts? Is it suspension for city kids, and “Festivus for the rest of us”? City parents: Tell us your story. Make way, New Orleans, Chicago, Detroit and Phillie!! Baltimore is gaining on you in the race to destroy public education! Who will win? The corporations with the most real estate. Maryland public education is a land grab for the education technology industry and privately managed charter schools. Meet Calvert Education and Camden Partners: Because They’re Coming to a District Near You! The company was founded in 1906 and is based in Hunt Valley, Maryland. As of October 7, 2013, Calvert Education Services, LLC operates as a subsidiary of VSCHOOLZ, Inc. Enter Pearson. Are we surprised? Baltimore-based Calvert Education Services has appointed education company executive Steven C. Gross as its new CEO. Gross had been senior vice president of marketing for the school business segment of Pearson Plc. Calvert Education Services is a portfolio company of Camden Partners. Camden Partners is a Baltimore-based private equity firm that funds and participates in the growth of well-managed emerging public company businesses within the business services, health care and education industries. Current investments include: Infocrossing, Inc., Blue Rhino, Concorde Career Colleges, Superior Consultant Holdings and Pharmanetics. David Warnock is a managing member of Camden Partners. He is also co-founder of the Green Street Academy and co-chair of the board of trustees. In January 2014, Warnock and Camden Partners sponsored an event in Baltimore and invited all the education “colonizers” where they all learned how to profit from education reform policies. Private Equity Investing In For-Profit Education Companies: How Affordability Is the Game-Changer For New Business Models. Facts like these are what make the for-profit education sector so appealing to investors. A study released by the National Alliance for Public Charter Schools ranked Maryland’s charter school laws the so-called “lowest” in the nation for the second year in a row. Well of course they did! NCPCS funded by the billionaire’s boys club (Walton Foundation, Bill and Melinda Gates Foundation, Eli Broad Foundation, and Carnegie Corporation of New York) making Baltimore their home. Not to worry! With Larry Hogan at the helm opening the flood gates, Warnock stands to profit handsomely. The constellation of corporate interests in spreading rapidly in Baltimore. And privatization of public schools and the teaching profession won’t be far behind.